Autumn’s most exciting news has been Springer’s publication of our book, International scholarships in higher education: Pathways to social change, in hardback and e-book. The finished manuscript is the culmination of an enormous effort by 22 colleagues based all around the world. For the editors – Joan Dassin, Robin Marsh, and me – working on the text has been a stimulating experience and we have each made a multitude of connections with other researchers and specialists. The development of a rich network of connections between authors is one of the less visible impacts of working on a book project but can be one of the most profound: already collegiate relationships catalysed by participation in our edited text have generated new research collaborations and professional exchange. On my way to the eighth Donor Harmonisation Group annual seminar – my fourth attendance – to catch up on higher education and international development projects and to talk about the new book, International Scholarships in Higher Education: Pathways to Social Change. 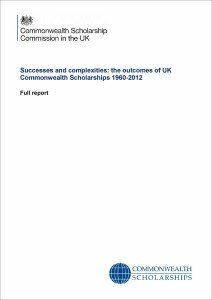 What are the current ‘hot topics’ in policymaking around scholarship programmes? How closely do they relate to topics in the book? What are the top research priorities from an administering agency and funder perspective? How do we continue to make the links between administering agencies and academia, especially the detailed and extensive work of graduate students? Is there genuine appetite to work with researchers and others to build partnerships and conduct research? If we created a list from today of staff who wanted to be contacted about participating, who would be on it? I am particularly interested in that last point: is this an agenda that we can genuinely push with some home of progress? In the UK, the various departments of government have begun to set out ‘Areas of Research Interest’ with the intention of helping to guide academic research that aims at policy influence. I wonder how far it is possible to achieve this in the international scholarship space as well? July 2017 saw the launch of the Scholarship Program Research Network (SPRN), an informal virtual community that aims to bring together individuals who study and evaluate scholarship programmes (both international and domestic). The purpose of the SPRN is to connect individuals and organisations across sectoral and geographic divides, share resources, and facilitate opportunities for future exchange and collaboration. Read the launch post on the ACU Measuring Success? Blog. Join the SPRN LinkedIn Group. View SPRN bibliography on Zotero or download a copy to your reference manager (or view as a MS Word doc) in our Google Drive folder. Re-post of my recent blog in the ACU’s Measuring Success? series. Original post here: ACU Measuring Success? The increased profile of longitudinal research within scholarship evaluation is a testament both to the difficulties presented by previous approaches and to the will of policymakers and administering agencies to grapple with those complexities and strengthen the evidence-base for grant making. Whether conducted within administering agencies or outsourced to expert consultants, contemporaneous research tracking scholarship alumni during and post-scholarship is fast becoming the ‘gold standard’ for assessing individual-level impacts. Alongside my colleagues Prof Joan Dassin and Dr Robin Marsh, I am very pleased to be editing a new book which has been commissioned to be written across the course of 2016. The text will be called ‘International scholarships in higher education: Pathways for social change’ and will include contributions from authors based across the world and in organisations spanning government, academia, NGOs, and more. An overview of the book contents is available here. We are very excited to have been able to develop the edited collection from our meetings over the last 1-2 years with colleagues involved with international scholarships, in particular the workshop co-convened by Brandeis University and the Association of Commonwealth Universities last May in Boston.